In one of the churches I served, a church member coming through the receiving line after the Sunday morning worship service urgently said she wanted to come in the next day to talk to me about my sermon. She looked deeply concerned and very serious, and so, even though it was supposed to be my day off, I agreed to meet her at the office early the next morning. All that afternoon and late into the evening I analyzed both my preparation process with the scriptural texts and the sermon moment trying to anticipate what I had said that might have elicited such a response. Had I said something that troubled her? Challenged her? Offended her? Or was it something stylistically in the way I preach that she felt needed to be addressed? Was it because I was not preaching from the pulpit? Did I have verbal tics or nervous pauses of which I was not aware? I made a mental list of the topics or concerns that might arise. I even rehearsed what I might say and how I might appropriately respond. I had made the determination by the next morning that, regardless of what she said, I would listen with an open heart and not respond defensively, but rather respond graciously and pastorally. I had braced myself for the worst. Yet, of all of the scenarios and conversations I envisioned, none came even close to reality. I was stunned and almost rendered speechless. She was angry, on the verge of outrage, as she leveled her criticisms about my preaching and theology. After listening to her for about fifteen minutes, and when she finally took a breath, I said, "Before I respond, I want to clarify to make sure that I am hearing you correctly, you are offended by my preaching and teaching because you feel as if I speak too much about love and grace?" She quickly and bitterly responded, "Yes, that is what I have been saying. It is ridiculous! How do you think we, or better yet our children, are going to grow in the faith if you are always talking about love? I swear, in every worship service, you feel the need to remind us that God loves you or that we need to love everyone. It's all so mushy gushy. Love. Love. Love. Geez, Pastor Shana, where is the challenge we really need to hear and think about? What about God's wrath? What about God's judgment? Oh, and don't even get me started again on the whole grace thing. I mean really; do you think such preaching is going to make the kind of difference in the world God wants?" I have to confess that, although I think I was gracious and I tried to be pastoral, I don't know if I said much that made sense to her. She and I were obviously not on the same theological wavelength. Yet, I wondered if there was some unrest in her personal life that was spilling over. I would never know fully, as two weeks later she wrote a letter to the church council announcing she and her family were leaving the church because of the pastor's "unbiblical" teachings. For longer than I care to admit, her criticism bothered me. For longer than I care to admit, I also considered that maybe love and grace were "soft" theological concepts. However, I finally made peace with two things. First, I am not a fire and brimstone preacher. I have never been; and I never will be. It's not just that it's not my style, it is not my theology. My God is not of judgment and wrath; nor is my Savior's nature to condemn and cast aside any one of God's beloved children. Secondly, love is one of the biggest challenges and the most difficult endeavor humanity can ever undertake. 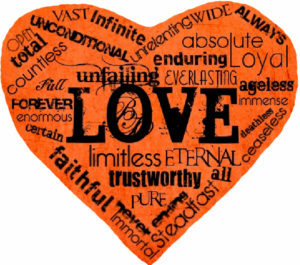 To love without judgment, to love without conditions, to love without limits, to love without an expectation of anything in return, to love each and every person the way that God loves is no small feat. If such love was easy to master or something that simply came naturally to us, we would not be living in a world filled with so much division, strife, intolerance, hatred and pain. Too often, the direct result of the absence of such love is fear, suffering, and destruction. Love takes work. Love is a conscious daily (or minute by minute) choice. Love does not make us weak; it makes us strong. Love is often the most radical, unexpected, and disarming response. Love is the core essence of our Creator and our Savior. Love is the highest calling. Love is needed now more than ever, because love has the power to transform hearts and minds...both ours and those to whom we are showing love. Love makes all the difference in the world.